Hello! I’m back today with another card that I created this weekend while crafting with my Mom and Sister! I only had a limited amount of supplies that I brought with me so I was challenging myself to make a few different cards using the same materials. 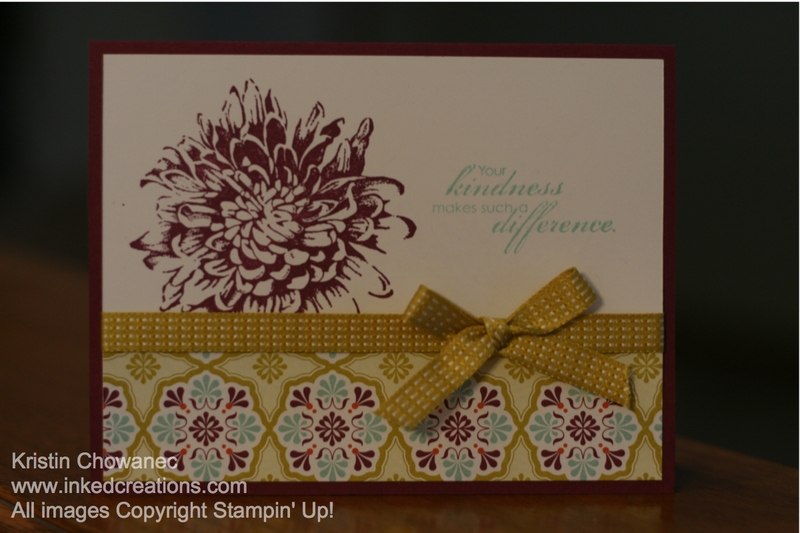 This card was made using the fabulous new Designer Series Paper called Sycamore Street from the Sale-A-Bration catalog. I just love this paper! If you haven’t looked at the Sale-A-Bration goodies that you can receive for FREE with any $50 order, go check them out! There are papers, stamps, ribbon, buttons, and more to choose from! If you need a catalog just let me know, I would be happy to send one out to you. You can also check out the catalog online by clicking HERE.